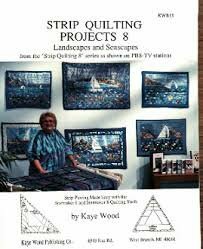 12 projects including Porthole Sky Sampler, Autumn Leaves - an attic window quilt and a Stormy Sea Pillow. Ready to try something new? This Landscape and Seascape book may be just what you're looking for. Accuracy in cutting, sewing and pressing is stressed as well as working with the designs of the fabric and matching seamlines. Lots of finishing techniques such as borders and bindings, batting, layering, machine quilting, hangings and figuring how wide your bindings should be.